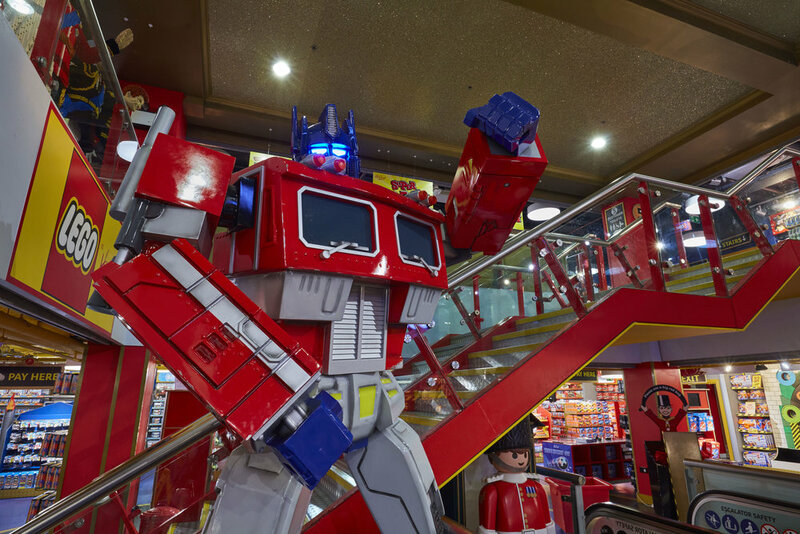 Installed in Hamleys’ 4th Floor to drive footfall to the 5th floor where the Transformers area is situated. The Propability Optimus Prime for Hasbro was originally an instore display feature that was built to have both longevity and durability. The sculpt was made to be as large as possible and fit in the retail space allocated with lights and interactive sound effects that could be seen or heard across the store. It stands 3 metres tall and creates a VM dimension that was designed to really pull the product off the shelf. The sculpt is activated by motion sensor technology in its arm that acts as a switch to speak when shoppers pass by. Transformers sound effects are played on a loop with the eyes illuminated with blue LED to bring the piece to life.